For the song written by Jimmy Webb, see P.F. Sloan (song). P. F. "Flip" Sloan (born Philip Gary Schlein; September 18, 1945 – November 15, 2015) was an American pop-rock singer and songwriter. 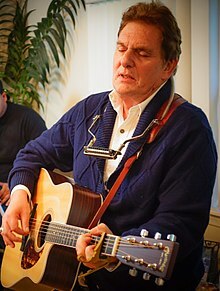 He was very successful during the mid-1960s, writing, performing, and producing Billboard top 20 hits for artists such as Barry McGuire, The Searchers, Jan and Dean, Herman's Hermits, Johnny Rivers, The Grass Roots, The Turtles and The Mamas & the Papas. Many of his songs were written in collaboration with Steve Barri. His most successful songs as a writer were three top ten hits. Barry McGuire's 1965 "Eve of Destruction", Johnny Rivers' 1966 "Secret Agent Man" and Herman's Hermits' 1966 "A Must to Avoid". Sloan was born in New York City to an American father and a Romanian-born mother. His family moved to West Hollywood, California in 1957, where his father, a pharmacist, changed the family surname from "Schlein" to "Sloan" after repeatedly being denied a liquor license for his store. When Sloan was 13 his father bought him a guitar. While at the music store in Hollywood Sloan met Elvis Presley, who gave him an impromptu music lesson. In 1959, at 14, "Flip" Sloan recorded a single, "All I Want Is Loving" / "Little Girl in the Cabin" for the L.A. R&B record label Aladdin Records, which folded soon after its release. At 16, he became part of the burgeoning Los Angeles music scene, landing a job on the songwriting staff at music publisher Screen Gems, which was then the largest publisher on the West Coast. There, he formed a partnership with Steve Barri, and the duo made several attempts at recording a hit single under names such as Philip and Stephan, The Rally-Packs, The Wildcats, The Street Cleaners, Themes Inc., and The Lifeguards. In 1963, they came to the attention of Screen Gems executive Lou Adler, who decided to use them as backing singers and musicians (Sloan on lead guitar and Barri on percussion) for Jan and Dean, whom he managed. Sloan and Barri wrote the theme song for the T.A.M.I. Show (Teen Age Music International Show) and were credited on all Jan and Dean albums from Dead Man's Curve / The New Girl in School in early 1964 through Command Performance in 1965. Jan Berry used Sloan as the lead falsetto voice instead of Dean Torrence on the band's top 10 hit "The Little Old Lady from Pasadena". Around that time, Sloan and Barri also wrote their first U.S. Billboard Top 100 hit, "Kick That Little Foot Sally Ann", arranged by Jack Nitzsche and performed by a Watts, California-born artist named Round Robin. Soon they also appeared on surf records by Bruce & Terry and the Rip Chords, and they recorded their own surf singles and album as The Fantastic Baggys. Adler then doubled their salaries to hire them for his startup publisher Trousdale Music and startup label Dunhill Records. Using the name Phil F. Sloan or P.F. Sloan (the "F" stood for "Flip," his nickname), Sloan wrote or co-wrote hits for many performers, including "Eve of Destruction" (Barry McGuire); "You Baby" and "Let Me Be" (The Turtles); "A Must to Avoid" and "Hold On!" (Herman's Hermits); "Take Me For What I'm Worth" (The Searchers); and "Secret Agent Man" (Johnny Rivers). This last song was the theme tune for Danger Man, a British TV series that had been given a new title (Secret Agent) and theme for the US market. Due to its line "You're old enough to kill, but not for votin'", "Eve of Destruction" was used as a rallying cry by supporters of the Twenty-sixth Amendment to the United States Constitution, which changed the voting age from 21 to 18 as of 1971. Sloan also became a session guitarist as part of the group of L.A. session musicians known as The Wrecking Crew, working with such well-known backing musicians as drummer Hal Blaine, guitarist Tommy Tedesco, bassist Joe Osborn, and bassist/keyboardist Larry Knechtel, among others. While working with Barry McGuire, Sloan created and played a guitar introduction as a hook to a new song by John Phillips entitled "California Dreamin'", and the same backing track was used for the hit version by Phillips' group The Mamas & the Papas, which led to Sloan being a regular in their recording sessions. Sloan generally played the lead guitar tracks on most of the songs he wrote, including the famous riff in "Secret Agent Man." Sloan and Barri also were performers while on Dunhill. They released Dunhill's first album, a collection of surf instrumentals, as the "Rincon Surfside Band," and the album was later issued by RCA under the name "Willie and the Wheels." Sloan's successful folk-influenced songwriting caused Dunhill to record two solo albums by him. His single "Sins of a Family" reached the Billboard top 100 in fall 1965, in the wake of the huge success of "Eve of Destruction." During this time, Sloan & Barri continued to do session work with Jan Berry of Jan & Dean, until Jan's near-fatal car wreck in April 1966, which basically ended Jan & Dean's career. They also produced a number of other acts, from Ann-Margret to The Robbs to Canadians Terry Black and Patrician-Anne McKinnon (both of whom had hits in Canada with Sloan-Barri songs) to Dunhill acts such as Shelley Fabares, The Ginger Snaps featuring Dandee Duncan, The Thomas Group (headed by Danny Thomas's son Tony), and The Iguanas (a Mexican band that did not speak English). The main Sloan-Barri recording effort for Dunhill was done under the name The Grass Roots. However, after The Grass Roots enjoyed a Billboard Top 30 single with "Where Were You When I Needed You", the band's first album failed to chart, and Dunhill forced Sloan and Barri to recruit a real band to perform as The Grass Roots. Ultimately, a second band had to be recruited after the first one quit. Sloan and Barri continued as producers for the band, and they quickly generated a U.S. top 10 hit with a cover of the European hit, "Let's Live for Today" (by the British band The Rokes). After that, though, the new Grass Roots wanted to write their own songs, and Sloan, who still wanted to be a recording artist, became alienated from both Barri and Dunhill management. According to Barri, Sloan changed after the success of "Eve of Destruction": "He was two people. We were just two Jewish kids from New York. We liked the same movies. We played Wiffle ball together. But when 'Eve of Destruction' became such a smash, he went with Barry McGuire to England, and he came back a different person. His girlfriend, who I later married — both of us felt he never returned from England. He was a major, major talent. God, he was good." Sloan himself also described a change at this time: "I wanted to be loved. I wanted to be Elvis. . . . But P.F. Sloan? He wanted honesty and truth." During the Summer of Love, Sloan played as a solo artist on the final day of the Fantasy Fair and Magic Mountain Music Festival on Sunday June 11, 1967. A famed celebration of pop music, this seminal event occurred prior to the Monterey Pop Festival held the following weekend, although unlike the Monterey event no film or audio recordings were preserved and its history is much less known. Sloan's final Dunhill release was a solo single, "I Can't Help But Wonder, Elizabeth" b/w "Karma (A Study of Divinations)", once again released under the name Philip Sloan. After leaving Dunhill, Sloan recorded an album in 1968 titled Measure of Pleasure. It was produced by Tom Dowd and released by ATCO. In 1969, Sloan's "New Design" was included on the Ruby, Don't Take Your Love To Town album by Kenny Rogers and The First Edition. Sloan left the music scene due to numerous business and legal problems. He repeatedly reported that Dunhill made threatening advances to force him to sign away the rights to his valuable compositions and that the reason for his absence from the music scene was to battle illnesses. After 1969, he did not frequently record or perform until the new millennium. He finally found relief from his long illness with help from Indian guru Sathya Sai Baba. In 2006, describing this period away from the world, Sloan said, "I was ill I guess for a good 20, maybe 25 years. . . . Catatonia for a long time." Sloan only released two albums during this period: Raised on Records, released on Mums Records in 1972 while he was recovering from illness, and Serenade of the Seven Sisters, released on Pioneer Records in Japan in the early 1990s, because Sloan's From A Distance (from his second solo album) had been successful there. Positive response led to the Japanese album being released worldwide. In 2005, Sloan made a series of recordings with producer Jon Tiven in Nashville, Tennessee. The resulting album, Sailover, was released in August 2006 on the Hightone Records label. Sailover was a veiled reference to the guru that helped him get well, proclaiming that Sloan was indeed a "Sai Lover". Tiven played guitar on the record and his wife Sally played bass. The album was a mix of classic and new compositions, including several new songs co-written with Tiven. Guests included Frank Black, Buddy Miller, Lucinda Williams, Felix Cavaliere, Tom Petersson and Gary Tallent. In 2014, Sloan's final series of recordings appeared on his album titled My Beethoven. These recordings began when Sloan attended a concert in Los Angeles featuring Beethoven compositions that affected him deeply. He focused on fully understanding the similarities between the legendary composer and himself. This journey of discovery took him a full decade to complete. He learned to play and compose with a piano during the process. The work enabled him to heal the wounds that he encountered during the trials and tribulations of his life. This last musical project led to him forgiving his transgressors, leaving his anger behind him and moving forward with peace, love and serenity for the remainder of his life. In 2015, Sloan published a book, co-written with S.E. Feinberg, entitled What's Exactly the Matter With Me? Memoirs of a Life in Music. Sloan died on November 15, 2015 at his home in Los Angeles. He had pancreatic cancer for several months and his death was attributed to that disease. "I Can't Help But Wonder, Elizabeth"
The Fantastic Baggies "Tell 'Em I'm Surfin'"
1965 The Fantastic Baggies "It Was I"
The Grass Roots "Mr. Jones (Ballad of a Thin Man)"
1966 The Grass Roots "Where Were You When I Needed You"
1967 The Grass Roots "Let's Live for Today"
"Things I Should Have Said"
Sloan's early work has been poorly represented on compact disc, with only a smattering of releases to his name. Measure of Pleasure was reissued on CD in January 2007. There is a collection of his demo recordings available (Child of Our Times), and there was a now-out-of-print 1993 anthology of his Dunhill recordings. In 2008, UK-based Ace Records did a near-definitive reissue of Sloan's solo recordings for Dunhill. Entitled Here's Where I Belong: The Best of the Dunhill Years 1965–1967, the CD omits the album tracks "When The Wind Changes" and "Patterns Seg. 4". Sloan's final Dunhill recording, "I Can't Help But Wonder, Elizabeth", made its legal CD debut on this release. "P.F. Sloan" is also a song by singer-songwriter Jimmy Webb, who is better known for the 1960s hits "By the Time I Get to Phoenix" and "Up, Up and Away". Cover versions of the song were recorded by The Association in 1971, Jennifer Warnes, and by British band Unicorn in the early 1970s – released as a single and album track on Transatlantic Records. 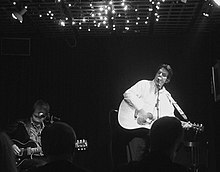 Jackson Browne performed the song with Webb on Webb's 2010 album Just Across the River. In 2012 it was covered by the British singer, Rumer, who treated it as the signature song on her Boys Don't Cry album. While Sloan's insistence on becoming a recording artist was an inspiration to fellow songwriter Webb, who had worked with Sloan with Bones Howe and The 5th Dimension, a personal dispute led Webb to deny the existence of "P.F. Sloan" when asked about the song's title character during an article interview, saying that he had made the name up. Eugene Landy laid claim to being the real P.F. Sloan when he was asked by reporters why he considered himself able to direct Brian Wilson's musical career. Landy claimed to have written the songs attributed to "P.F. Sloan". ^ a b c d Scott R. Benarde (July 2003). Stars of David: Rock 'n' Roll's Jewish Stories. p. 91. ISBN 1-58465-303-5. ^ a b c d Chawkins, Steve (17 November 2015). "P.F. Sloan dies at 70; wrote '60s protest song 'Eve of Destruction'". Los Angeles Times. ^ a b Weber, Bruce (17 November 2015). "P. F. Sloan, Enigmatic Writer of '60s Hit 'Eve of Destruction,' Dies at 70". New York Times. Retrieved 20 November 2014. ^ Liane Hansen (August 20, 2006). "PF Sloan's Long Road Back from 'Destruction'". National Public Radio. Retrieved 2011-02-19. ^ Dan Daily (July 1, 2004). "Classic Tracks: The Mamas & The Papas' "California Dreamin'"". Mix Magazine. Archived from the original on February 4, 2012. Retrieved 2010-11-18. ^ Lomas, Mark. "Fantasy Fair & Magic Mountain Music Festival". Marin History. Marin Independent Journal. Archived from the original on April 21, 2009. Retrieved December 29, 2011. ^ Gene Sculatti (August 14, 2006). "'Eve of Destruction' poised to explode again". USA Today. Retrieved 2010-11-17. ^ "PF Sloan – Interview With Sathya Sai Baba". Retrieved 2017-07-19. ^ . "P.F. Sloan: My Beethoven". PopMatters. Retrieved 2016-02-06. ^ "Rolling Stone". Retrieved 2017-07-19. ^ "Item Display - RPM - Library and Archives Canada". Collectionscanada.gc.ca. Retrieved 2016-02-06. ^ a b c d "P.F. Sloan ••• Top Songs as Writer ••• Music VF, US & UK hits charts". Musicvf.com. Retrieved 2016-02-06. ^ "Item Display - RPM - Library and Archives Canada". Collectionscanada.gc.ca. Archived from the original on 2016-03-14. Retrieved 2016-02-06. ^ "Item: 10563 - Library and Archives Canada". Bac-lac.gc.ca. Retrieved 2016-02-06. ^ Hann, Michael (17 November 2015). "PF Sloan: the 1960s enigma admired by Bob Dylan and Jimmy Webb". The Guardian. Wikimedia Commons has media related to P. F. Sloan.